Iams ProActive Health Adult diets are a range of nutritionally tailored foods, formulated to cater to the dietary needs of dogs between 1 and 7 years old. The diets contain the highest quality ingredients and are free from all artificial colours, preservatives and flavours to suit dogs with sensitive stomachs and digestions. The unique formula diets are fortified with advanced vitamins and minerals to support the health and function of internal systems and strengthen your dog's natural defenses. Various dietary fibres will further aid the health of the digestive tract, whilst helping to regulate and maintain small stools. Omega fatty acids 3 and 6 are combined to improve the condition of skin and coat for healthy-looking appearance and aid in the maintenance of joints, allowing your dog to sustain an active lifestyle. 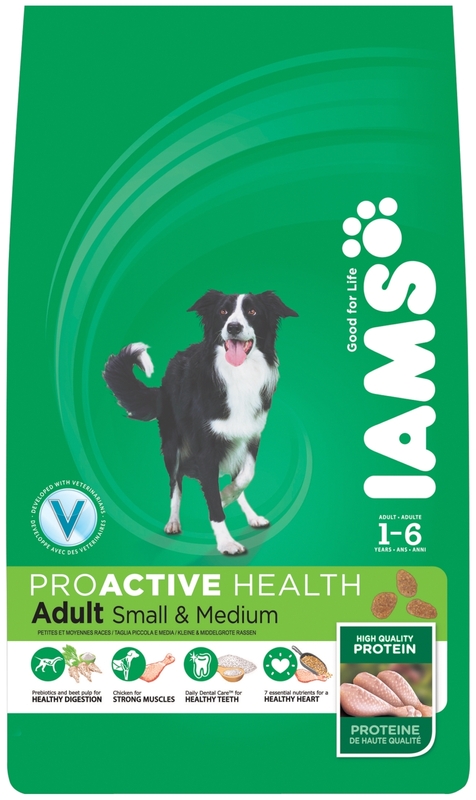 There are currently no questions for Iams ProActive Health Adult Small & Medium Dog Food - be the first to ask one!